The Health Behaviour Change Research Group, HRB Primary Care Clinical Trials Network Ireland, and the Health Promotion Research Centre have come together to run a joint seminar series to highlight research in the area of population health and health services. The seminars take place once a month on Tuesday at lunchtime in the School of Psychology. A light lunch will be served from 12.30pm. 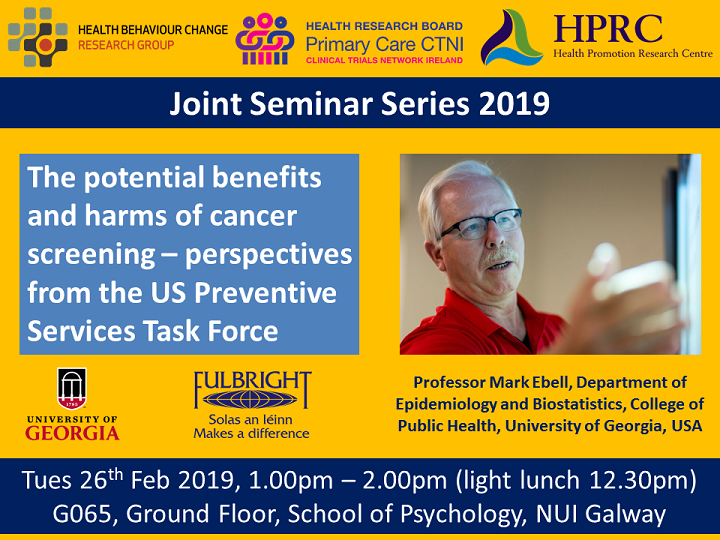 We are delighted that Professor Mark Ebell from the College of Public Health, University of Georgia, USA deliver the next seminar on Tuesday 26th February on the topic of The Potential benefits and harms of cancer screening – perspectives from the US Preventative Services Task Force. See below for details. While there are many kinds of cancer, for only a few is there evidence that the potential benefits of screening outweigh the potential harms. While potential benefits are substantial for a small number of those screened (a death averted), all patients experience some degree of inconvenience, and many are subjected to the harms of biopsies and other follow-up tests. A new kind of harm, increasingly recognized and present with most kinds of cancer screening, is overdiagnosis. As our technology has evolved, we are able to detect smaller and smaller lesions that may appear cancerous, actually do not behave like a cancer. About 1 in 5 persons who have a breast or lung cancer detected by screening would have lived a full life with the cancer never causing any symptoms (“overdiagnosis”). Dr Ebell will discuss the process of the US Preventive Services Task Force for making screening recommendations, how their recommendations compare with those in Ireland, the harms of both underdiagnosis and overdiagnosis, and what we can learn from each other about balancing benefits and harms. Dr Mark Ebell is a graduate of the University of Michigan’s Medical School, Family Medicine Residency, and School of Public Health. He is currently a Professor in the Department of Epidemiology and Biostatistics in the College of Public Health at the University of Georgia. Dr Ebell is Editor-in-Chief of Essential Evidence and Deputy Editor of the journal American Family Physician. He is author of over 350 peer-reviewed articles and is author or editor of seven books, with a focus on evidence-based practice, systematic reviews, medical informatics, and clinical decision-making. Dr Ebell served on the US Preventive Services Task Force from 2012 to 2015, and in 2019 will be a Fulbright Scholar at RCSI in Dublin, Ireland. Please feel free to circulate to colleagues and contacts who may be interested in attending!